Calculating your U.S. tax liability can be relatively simple or very complex, depending on your income and the number and complexity of your financial transactions. Nevertheless, it pays to get it right. If you underestimate, it might get you into trouble later, but if you overestimate, you must do without some of your hard-earned cash for a while. The basics of calculating personal tax liability can be broken down into four sums: total income, adjusted gross income, taxable income and total tax. Obtain Internal Revenue Service (IRS) Form 1040 and the IRS 1040 instructions for the year in which you are calculating your tax liability. These are two separate documents that can be downloaded from the Internal Revenue Service website. Calculate your total income. Total income includes wages, salary and tips. Check your W-2 forms issued by your employer and your 1099 filings and business records if you are self-employed. It also includes rent, dividends, capital gains (stock market profits, for example), interest income, unemployment compensation and other items listed on lines 7 through 21 of IRS Form 1040. Calculate your adjusted gross income. First add up all of your “above the line” deductions listed in lines 23 to 35 of IRS Form 1040. Allowable deductions include items such as reasonable self-employment expenses, IRA contributions, moving expenses, alimony payments, student loan interest payments and the like. Subtract your “above the line” deductions from your total income. The result is your adjusted gross income. Calculate your allowable deductions. First calculate your itemized deductions from Schedule A of Form 1040. These deductions can include medical expenses, state and local taxes and interest on mortgage payments. Then look up your standard deduction from Line 40 of Form 1040. Choose whichever of these two figures is larger and subtract it from your adjusted gross income. Calculate your taxable income. 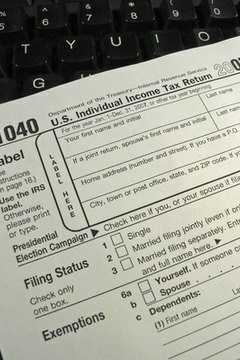 Multiply $3,800 (for tax year 2012) by the number of exemptions you claimed on Line 6 of Form 1040 (exemptions represent your number of dependents, including yourself). This is the value of your exemptions. Subtract this value from the result of the last step. The result is your taxable income. Calculate your total tax. This is done by multiplying your applicable tax rate by your taxable income. Your applicable tax rate is determined according to your taxable income and can be found beginning on page 74 of the 1040 Instructions. Carnes, David. "How to Calculate Personal Tax Liability." , https://legalbeagle.com/4926136-calculate-personal-tax-liability.html. Accessed 20 April 2019.